Sorry, but I don’t have any witty April Fools’ Day joke post for you. I am pretty sure if I told you I am moving to China or I decided not to go to college but instead become a yoga guru in India, on this specific day, you would know I was joking. I am not really big on April Fools’ and jokes and pranks. I would rather just have a normal Tuesday, thank you very much. + In a mixing bowl, combine the flours, egg replacer, baking powder, and cinnamon together with a fork. + Next, add the zucchini, stevia, and water. Mix well. Then let the batter sit for about 3 minutes. (You may need to add an additional TB of water). + In the meantime, use some coconut oil to coat a pan and heat on the stove over medium heat. + When the pan is hot, start making pancakes! When the edges look dry and bubbles start to form on the surface (about 3 minutes), flip the pancake and cook for another 2 to 3 minutes. Continue until all the batter is used. I usually end up with two large pancakes or 3 medium. + For the Chocolate Sauce: combine all dry ingredients in a small bowl, mix with a fork, then add the stevia and water and mix until you get your perfect sauce consistency. You may use more of less water. What is the best April Fools’ joke you ever did or had done to you? « Power Monday #39 Live The Vibrant Life! Wonderful recipe! Thanks for sharing it at Savoring Saturdays! Loved you post so much I featured it on Real Food Fridays Blog Hop this week. Looking forward to seeing more of your great posts. good combo! i love using PB flour in this way too, and buckwheat! 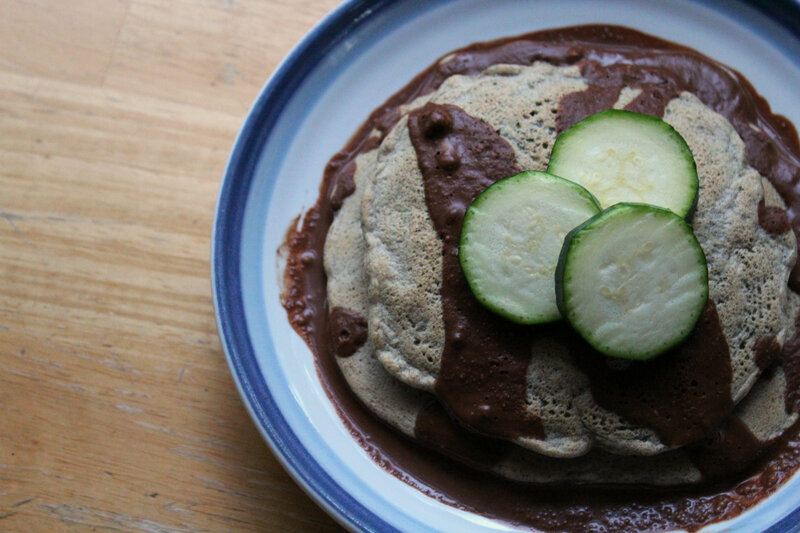 Thank you so much for sharing this healthy and delectable buckwheat pancake recipe at the Plant-Based Potluck Party Blog Hop! I appreciate it! I have always love to make zucchini bread so when I saw your recipe for zucchini pancakes memories of zucchini bread came to mind. 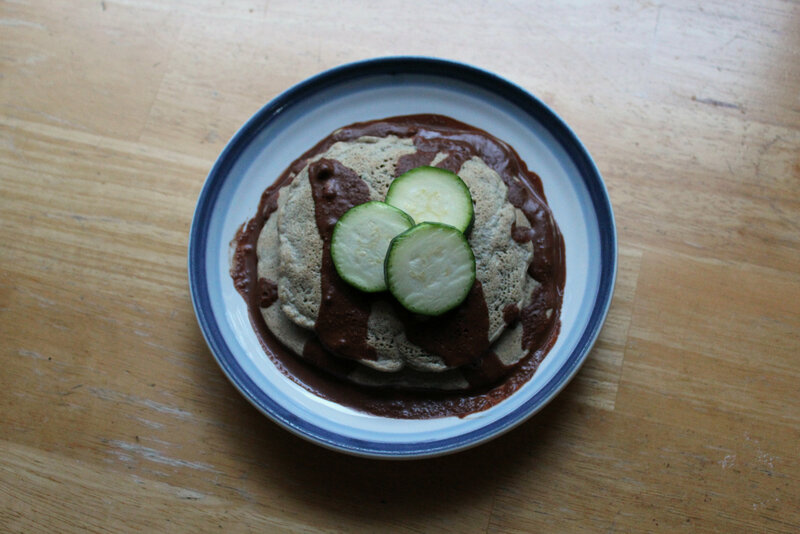 I love the idea of pairing the pancakes with chocolate peanut sauce. It all sounds so amazing! 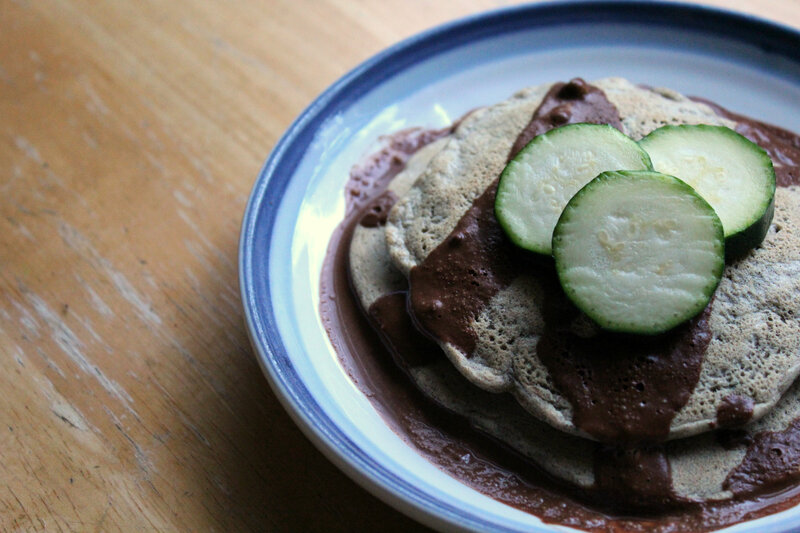 I am so glad you shared your zucchini pancake recipe with us at the Healthy Happy Green and Natural Party Blog Hop! I appreciate it! I am pretty sure I have never made or eaten actual zucchini bread! I need to get on that! What a shame… I just let 3 zucchini rot in my fridge. I totally want to try this! O no! This just calls for a reason to get more and redeem yourself, haha! These sound delicious! I think I would try almond and coconut flour with the peanut flour. I’m not big on April Fools Day either. Thanks for linking up to Savoring Saturdays! I’ve pinned to try later. Thanks Eva!The ratios of liquid would have to be changed if you, I’m not well versed on those flours! Thanks Laura! I am pretty much obsessed with pancakes and love playing around with new combos! Maybe you are just to good to be fooled 😉 But keep your guard up just in case, hahaha! 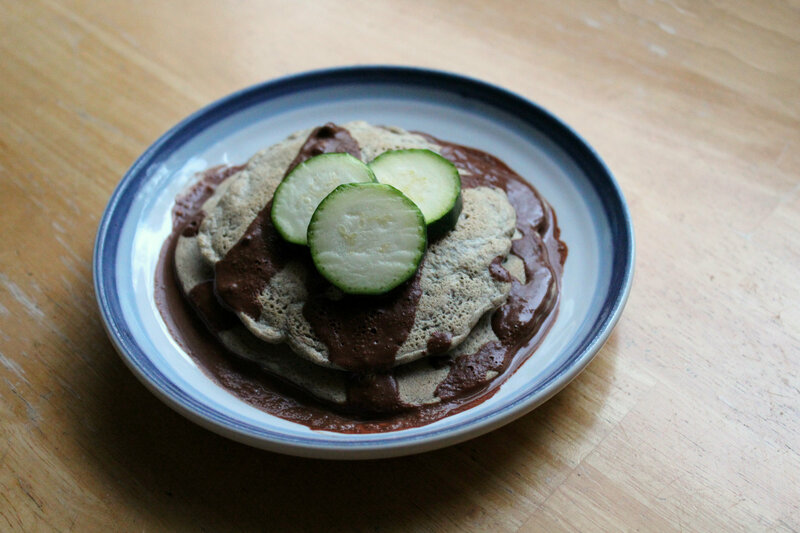 It makes so much better right 🙂 I love zucchini and always buy a huge amount for the whole week and then always have some ready for weekend pancakes and waffles! love the April Fools joke on your Mom! I can only imagine how startled just must have been with being sprayed with water right after waking up. I love your recipe for the zucchini pancakes. Pinned and sent to google. Thanks for sharing on Real Food Fridays Blog Hop! It was the best 😉 If it had happened to me though I would have been very mad, haha! Ohmygosh those pancakes look amazing! I am far from a prankster, but I imagine my husband will get me at some point today. He’s too good at keeping a straight face when he wants to trick me and I’m no good at knowing when he’s being truthful and when he’s just trying to get a rise out of me. 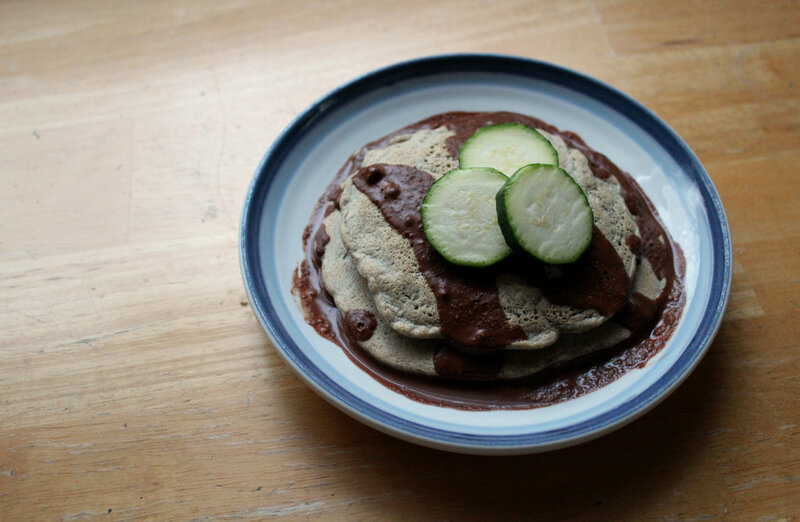 Ahhh I love buckwheat pancakes, these will be a definite make now! 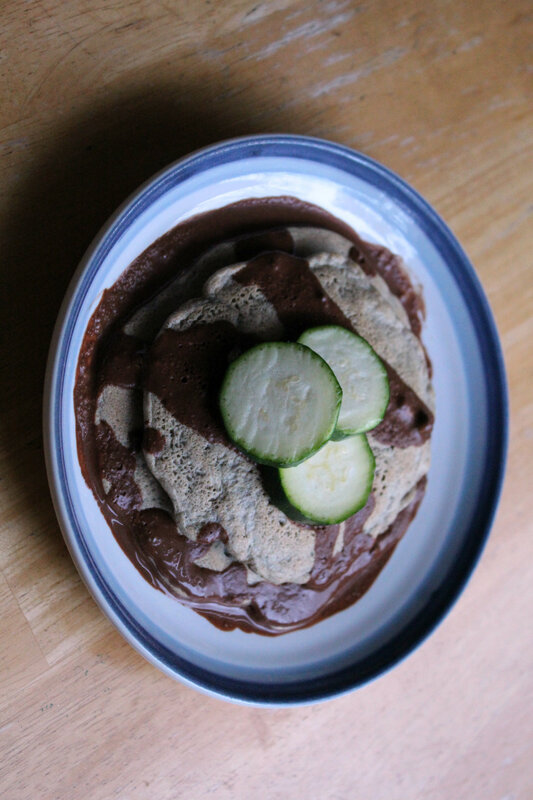 I love the idea of chocolate peanut sauce on top! Perfect post run breakfast food! Mmmm! I am not a picky eater, I will eat most things. My biggest trouble is that my sweet tooth is out of control….which is definitely a weakness in my training, I know I would be faster and leaner if I cut it down, but I love it too much! Ha Ha my mom would’ve killed me! She used to play the same one year after year (& we’d fall for it time after time), telling us schol was cancelled or delayed. You can imagine 2 kids waking up & being estatic! LOL. Joshua got me good last year. I shared the link on today’s post. With this crazy weather this year, a prank saying school is canceled could very rightfully be true!